These easy pies are among our most popular dinner ideas. A hearty mix of potatoes, carrots, and beef is seasoned with thyme and black pepper before getting stuffed into a pie crust. This dish allows each person to have their own pie, and they get to pick it up and eat it with their hands! RecipeSavants.com These easy pies are among our most popular dinner ideas. A hearty mix of potatoes, carrots, and beef is seasoned with thyme and black pepper before getting stuffed into a pie crust. This dish allows each person to have their own pie, and they get to pick it up and eat it with their hands! Smart Recipes, American Recipes, Beef,Eggs,Grains Recipes, Recipes Beef,Eggs,Grains American Classic Meat Pies PT1H10M Serves 4 Ingredients: 4 Cups Plain Flour 1 Teaspoon Baking Powder 0 To Taste Salt 1.5 Cups Cold Water 2 Cups Margarine 2 Tablespoons Vegetable Oil 1 Medium Onion 1 Pound Ground Beef 1 Cup Water 1 Teaspoon Dried Thyme 0 To Taste Black Pepper 2 Medium Carrots 1 Medium Irish Potato 2 Knorr Cubes 1 Medium Egg In a bowl, mix together 4 cups of flour, baking powder and very little salt. Add the margarine in small pieces and mix till a breadcrumbs like mixture forms. Slowly, add 1 cup of cold water and mix well till a dough forms. Cover the dough in cling film and refrigerate for about 30 minutes. In a pan, heat oil on medium heat. Add onion and sauté for about 2-3 minutes. Add the beef and stir fry for about 5 minutes. Add 1 cup of water, thyme, salt and black pepper and cook, covered for about 10 minutes. Stir in carrots, potato and Knorr cubes. Mix together remaining 2 tablespoons of flour with remaining ½ cup of cold water. Slowly, add flour mixture in pan and mix. Reduce the heat to low and simmer for about 2 minutes more. Remove from the heat. Preheat the oven to 350 degrees F. Grease a large baking dish. Divide the dough in small portions. Place each dough portion onto a lightly floured surface and with a rolling pin roll them slightly. Cut each portion in desired shape and place the filling and fold. With beaten egg coat the ends of the dough to seal the filling. 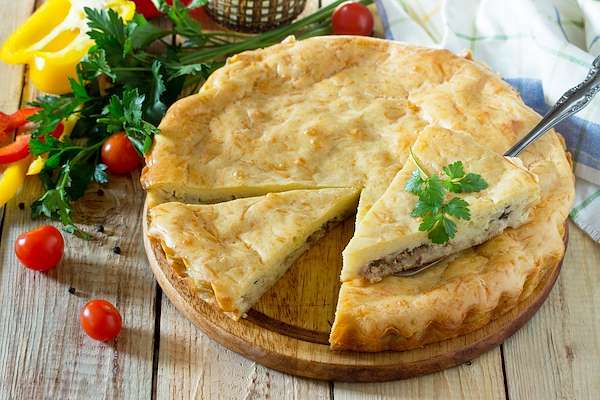 Arrange the pies onto prepared baking dish and coat each meat pie with beaten egg. Divide the dough in small portions. Place each dough portion onto a lightly floured surface and with a rolling pin roll them slightly. Cut each portion in desired shape and place the filling and fold. With beaten egg coat the ends of the dough to seal the filling. Arrange the pies onto prepared baking dish and coat each meat pie with beaten egg. Bake for about 30 minutes.